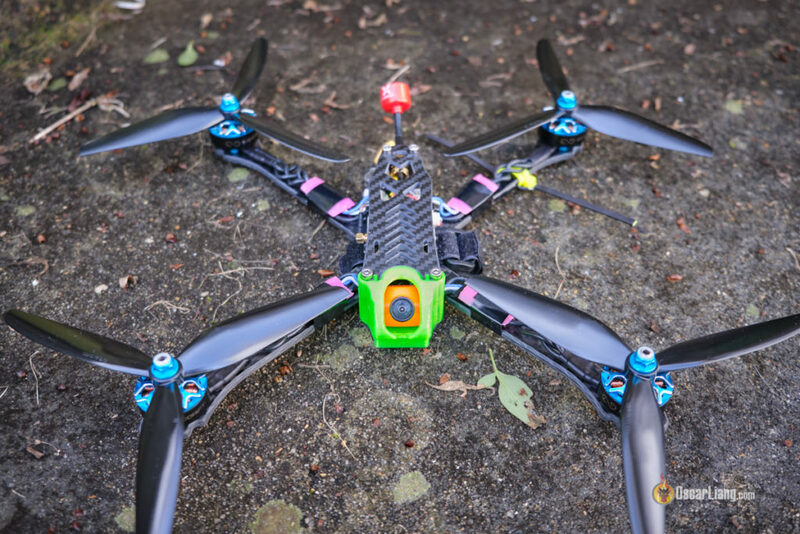 7″ quadcopters have better efficiency and flight time for long range than 5″. 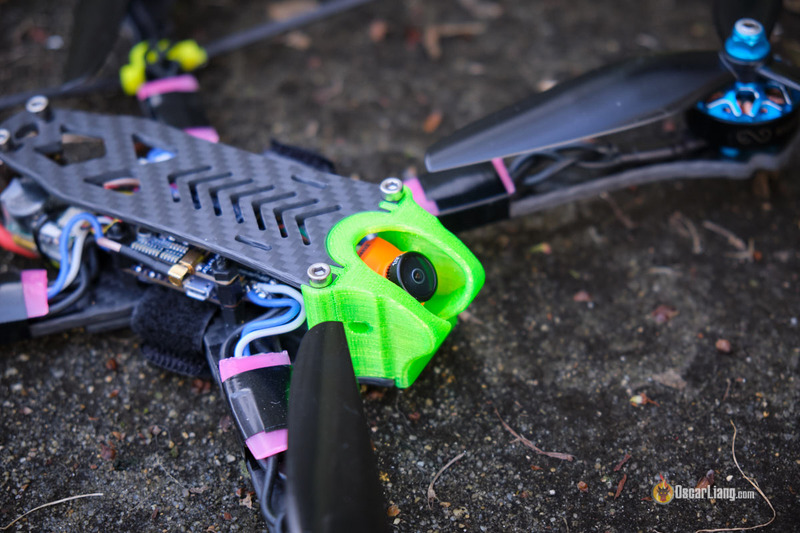 You can use a lot of same components from 5″ racing drones on 7″. It is larger than a 5″, but you can still comfortably carry it around. 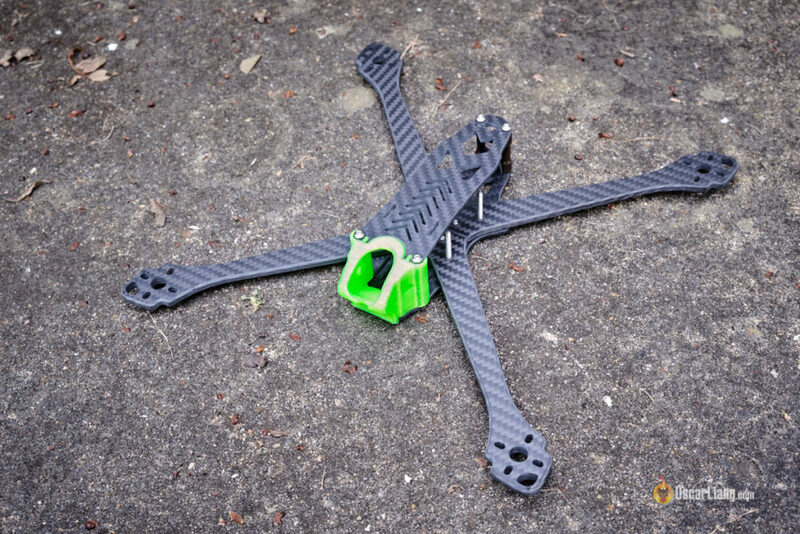 Learn about Mini Quad frames in this article. After consulting my Facebook group (IntoFPV) on what frame I should use, it came down to the Mode 2 Shredder 7″ frame. I really liked it because it’s one of the lightest frames in its class, at only 112.5g assembled. I will also check out the Martian IV 7″ frame too in the near future. For now let’s take a closer look at the Shredder 7″. Pro Tip: When we are talking about the size of a racing drone, we normally refer to the maximum propeller size it can take. In this case, a 7″ frame means it can take 7″ propellers. 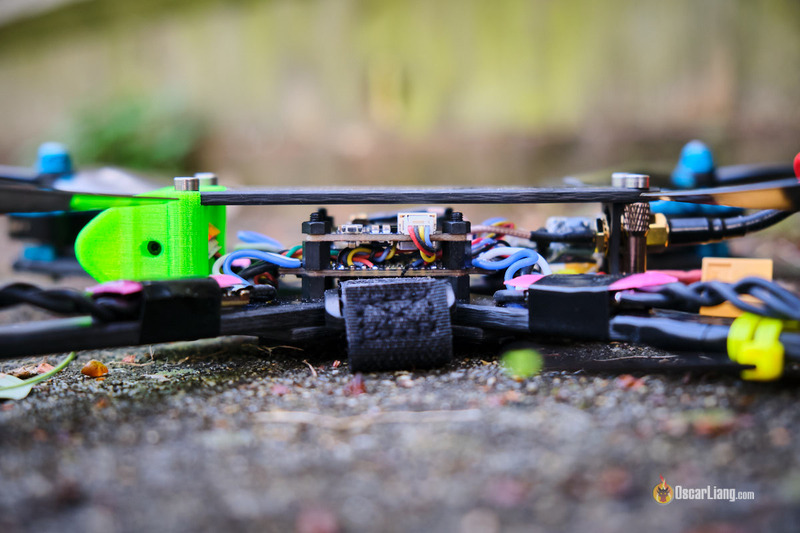 7″ frame typically have a wheelbase of around 300mm, sometimes as known as motor to motor distance. These are explained in more detail in my mini quad frame tutorial. I really like the simplicity, great attention to detail, and how easy it is to build. The replaceable and interlocking arms each takes only 2 screws. There are threaded metal inserts so there is no need for nuts. Not only this maximizes the use of space inside the frame, it also makes assembly effortless. It has good structural strength, the arms are stiff without any wiggles. Another nice touch would be the carbon fibre edges, all came chamferred with smooth round finish! The arms are 4.8mm thick, and top/bottom plates are both 3mm thick. 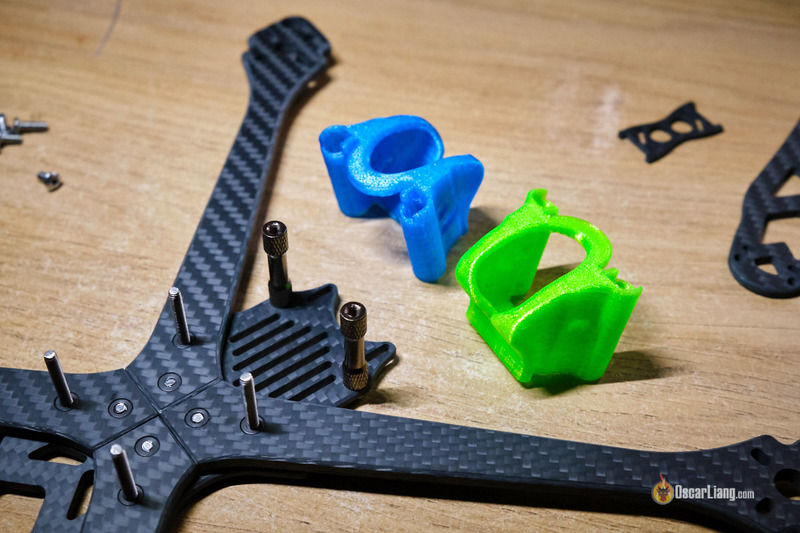 They offer 3D printed TPU camera mount in two colors – blue and green. Very nice printing quality by the way. 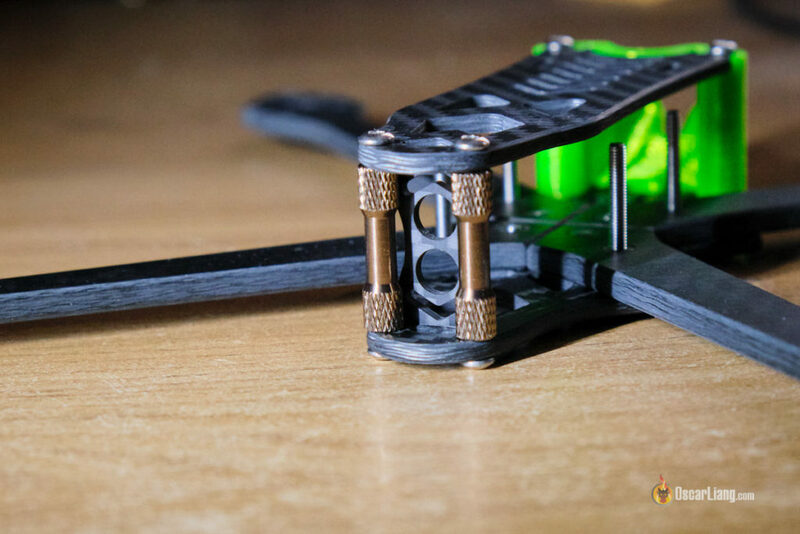 The TPU mount works really well with the frame, and it’s designed for mini and micro FPV cameras. One of the two screws in each arm is used for mounting the FC, so long steel screws are provided for the FC stack. It’s becoming popular to use long steel bolts for mounting FC / 4in1 ESC stacks, instead of nylon standoffs, because they don’t break in crashes. However I would advise against doing so if your 4in1 ESC and FC don’t use rubber grommets. Nylon hardware breaks because they absorb some of the impact. With steel hardware, the shock will be completely passed down to the boards if there isn’t any damping from rubber grommets. 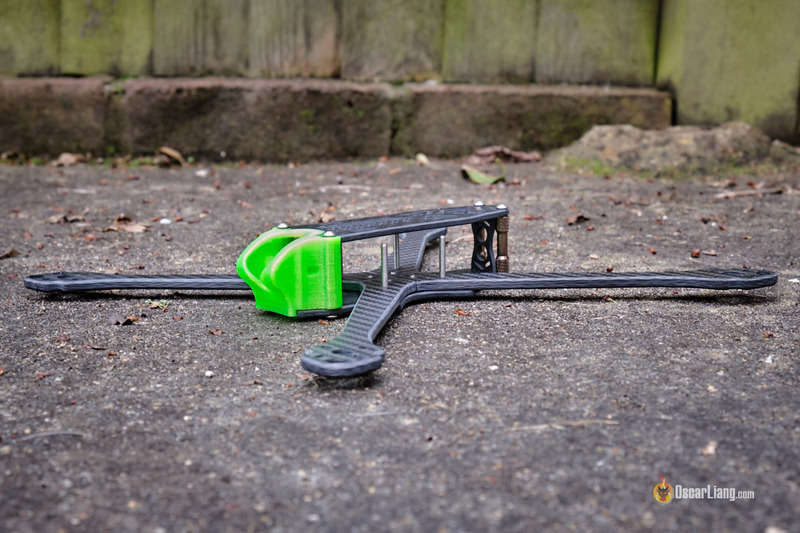 The Mode 2 Shredder uses a small piece of carbon fibre at the rear for mounting your SMA connector – a simple and effective solution. But I think it would be even nicer if they use TPU, one that slides into the standoffs. TPU is softer and perhaps more friendly for the antenna’s connector in crashes. 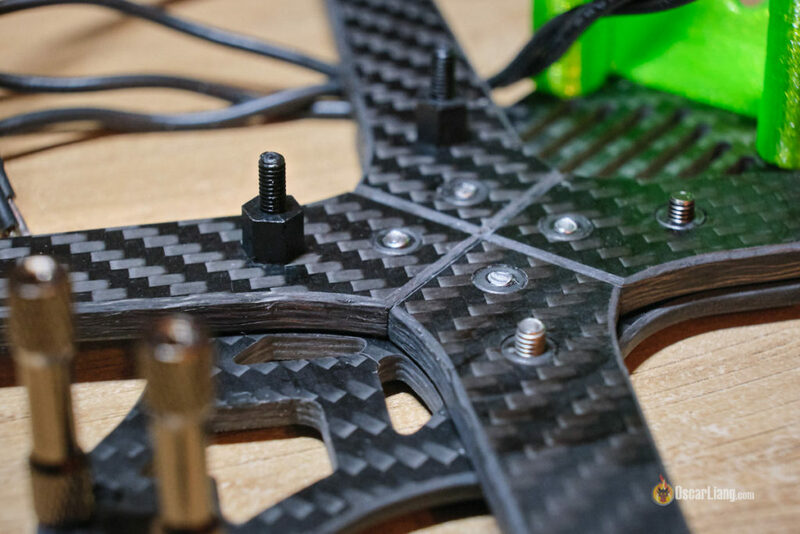 The frame seems to be designed for top mounted LiPo, as you can see, the bottom is full of bolt heads. But it’s not impossible to mount of your battery at the bottom, which I will show you how I did it. I was going to use a 4in1 ESC initially, but it’s going to be challenging fitting 3 boards in this frame (VTX+FC+ESC), given the little space we are working with (20mm height). So I went with these single light weight slim ESC’s from Holybro instead. Actually they turned out even better, the width of the ESC’s matches the arms perfectly. I got the Jetstream 2407 motors from Egodrift specially for this 7″ build. 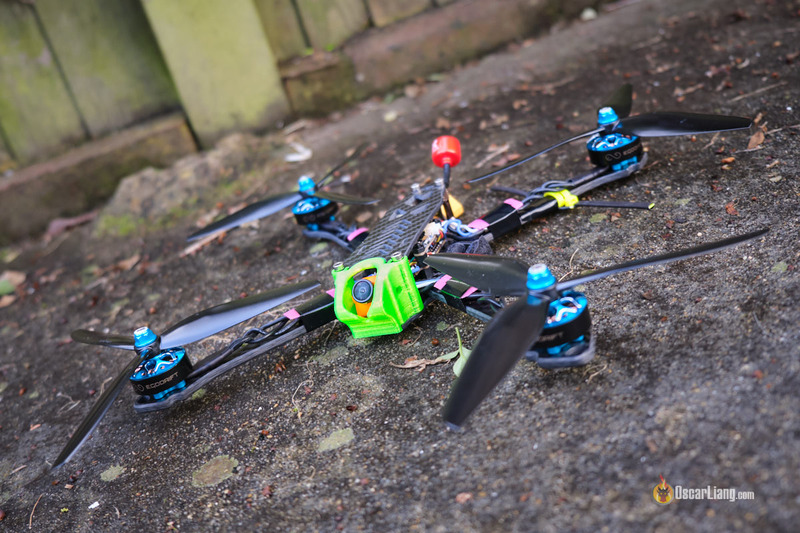 Previously running 2207 motors on a 7″ and it just didn’t feel right in the air – very sluggish, not as responsive as I wanted it to be, prop wash and bounce-backs (overshoot) were almost impossible to eliminate with tuning. My conclusion was that 22XX motors just don’t have enough torque to spin 7″ props. Hopefully these bigger 2407 would be sufficient. You might notice the KV is a bit on the low side (1500KV). My goal is good flight time and efficiency, and I am actually running triblade props so that should be adequate. With higher KV motors I would probably run dual blades instead. And what kind of long range quad takes off without a self-powered buzzer? :) In case of unexpected “landing” with battery ejected, you would have a bigger chance of finding the quad in the wild if the buzzer continues to beep. The Mode 2 Shredder 7″ frame looks like it’s little brother – the 5″ version, but with longer arms, the body isn’t particularly roomy for components. Using the Atlatl HV V2 VTX was a good decision as it can be mounted on top of the FC, leaving all the space at the rear for the RX and buzzer (and i was already struggling to fit these). As mentioned, I wanted to avoid steel bolts as the Kakute F7 doesn’t have shock dampeners (rubber grommets). That’s why I replaced the long steel bolts with some shorter ones, and use nylon standoffs for the FC stack. The build was straight forward. Once I assembled the frame, installed the motors and ESC’s, mounted the FC, and all that was left was wiring them up! I left more than enough slack in the wires. I will probably come back and trim them all up in the future if I want to go extreme with weight saving. Put on the top plate, and that’s it! All-up-weight is even lighter than some of my 5″ builds! As mention, not much space to work with in this frame. That’s the downside of a simple / light weight / low profile frame. But it’s manageable with a bit of planning. The FPV camera mount might look a bit big for micro cameras, but none of the mount is obstructing the camera’s view – this is the Runcam Racer V2 with 1.8mm lens. I decided to mount my LiPo at the bottom of the frame. To avoid all the bolts, I am using the Ummagrip battery pads. This stuff is very sticky, holds your battery well, and is thick enough to keep your LiPo away from the bolts (3mm). You might notice there is no GPS! What’s going on? No GPS, how do you know how far you have gone? It will also help you find the quad if you crash. Well I wanted to fly the quad and make adjustments to hardware until I am happy with it, then GPS. You can learn about setting up GPS in quadcopters in this tutorial. You can also setup Betaflight Rescue mode. Maiden flight went well. Some shakiness with stock settings. I will play with a few things and report back what helps. What is the total weight of the drone ? something about 800 gr ? Thanks for the comment Oscar. I figured out the problem – antenna wasn’t connected fully on the receiver. I mounted a 5000 mah turnigy 20c on the bottom. That’s how I got away with it. Which kind of props do you have ? I get 26 mins if I manage the throttle. Trying to go lighter and extend flight times by making my own 18650 battery pack. you recommended a battery between 2500 to 4000 mah, but which voltage ? 4 or 5 or 6s ? I guess more 4s for long flight time, because above 2500 mah in 6S is quite heavy no ? Currently I fly a 7 inch quad, with T-motor F40 PRO II 1600KV, bi-blades 6 inch and I get about 15 min flight time with 2800 mah 4s Lipo. I’m interested to update my config to gain few minutes more and get closer to 20 min flight time. I think 4S or 5S would be good choices depending on what props you use. Thank you for the great article. Long Range is a whole new thing. I agree that many parts are interchangeable but I cannot agree more that adding some extra power helps tremendously. I just built a Falcon Multirotor Raggio Lungo. The first ESC I used was way under powered. I upgraded to a 55amp 6s esc and couldn’t be happier. It eliminated noise and now my 7″ flies like an acro quad. Did you manage to solve the PID problem for the POSHOLD and ALTHOLD modes in INAV? What battery will you use, Oscar? 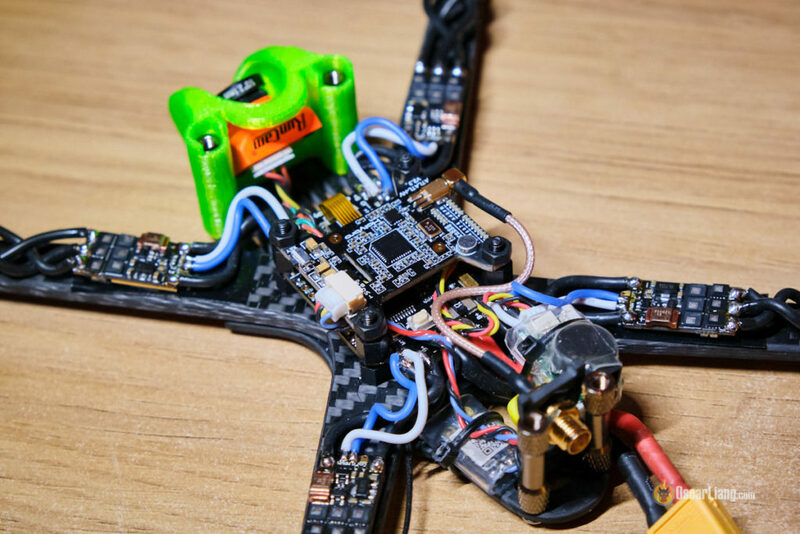 Is it possible to use standard 4S 1500mah lipos on long range? definitely much bigger than 1500mah. Maybe something along the line between 2500mah – 4000mah. Cool build! Report back on how the R9mm works. Just maidened mine and i get very low 20-50 RSSI. Any suggestions on where to start with troubleshooting this? I have both antenna wires mounted perpendicular to one of the arms so i don’t think this should be a problem. Working on finding how to update the firmware next. I get 22-23 mins mixed flying. I get asked quite often how to troubleshoot R9M.. I will make a troubleshooting guide shortly. First thing to make sure is you are using the right frequency, and correct antennas (868MHz and 915MHz have different antennas). Make sure they are mounted correctly too (see my R9M guide). Which kind of 5000 mah battery can you install on this chassis ? I have an XL6 and XL7, and the central part of the chassis is the same (same length & width), only the arms length change. I have already some difficulty to install on top a 2800 mah 4s 45C lipo on it ! I will be very interested to see your installation (bottom or top ? ), battery size and type (C rate, weight, number of cells). I am really interested to know more about your configuration, because I’m aiming to fly 20 minutes too. Nice build, but ya gotta put a GPS on there for RTH and knowing how far you get out!